Select were delighted to work with PG Online, a publishing company that provides lesson resources for teachers of Mathematics, Computer Science, Design Technology and Business, to explore the link between GSCE and A level results and use of their teaching materials. 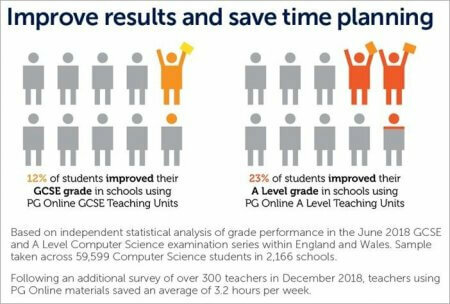 We were asked to analyse the 2018 school-level GCSE and A level results, published by the Department for Education (DfE), for schools that had purchased PG Online’s materials, comparing these with similar schools that were not PG Online customers. In addition to exam result data, we used other publicly available school demographic data, so that our comparison was to schools that were similar in as many aspects as possible. We found that the average GCSE point score of schools that had purchased PG Online’s materials for the new 9-1 GCSE syllabus was, on average, 0.12 points higher, (with a 95% confidence interval of (0.05, 0.20)) than other schools, taking into account differences in schools’ background characteristics, such as average GCSE Computer Science score the previous year, school type, region and the proportion of students with levels of special educational needs (SEN) and those eligible for free school meals (FSM; a proxy for deprivation). This can also be expressed approximately as 3 students out of every 25 being expected to achieve one grade higher at GCSE. There was less data available for the A level model than for GCSE, owing to the DfE suppressing the results for schools that were based on fewer than 5 students. From the data available, we again found that the average A Level point score of schools that had purchased PG Online’s A Level materials was, on average, 0.23 points higher (with a 95% confidence interval of (0.07, 0.39)) than other schools, again taking into account differences in schools’ background characteristics (specifically average A Level Computer Science score the previous year and the proportion of students who were eligible for FSM). This is equivalent to just less than 6 students out of every 25 being expected to achieve one grade higher at GCSE. Further details of the analyses and the results can be found in the full report published on PG Online’s website.